The tribe Mimoseae (sensu Bentham, 1875) is retained here simply as a matter of convenience. All recent phylogenetic analyses indicate that Ingeae and Acacieae are derived from within Mimoseae (Chappill & Maslin, 1995; Käss & Wink, 1996; Luckow et al., 2000; Bruneau et al., 2001; Luckow et al., 2003; Herendeen et al., 2003a), making it a paraphyletic group at best. The most recent studies indicate that it may not even be monophyletic with respect to the Caesalpinioideae (Luckow et al., 2000; Bruneau et al., 2001; Luckow et al., 2003). Although the outline of a new tribal classification of the mimosoids is emerging, we await better-supported phylogenies (based on more extensive data) before formalising new stable and useful groups. Some parts of the classification proposed here are better supported than others. Notably, the basal branches in Fig. 24 are poorly supported in most analyses and the relationships among the groups are likely to change as we acquire more data. As presently indicated (Luckow et al., 2003), the type genus Mimosa falls within the derived Piptadenia group which is in turn sister, and basally branching, to elements of Acacia and Ingeae (Fig. 24). A more narrowly circumscribed Mimoseae sens. strict. will thus leave the bulk of Mimoseae sens. lat. (i.e., as treated here) in need of new tribal allocation. The most conspicuous difference between the classification presented here and that of Lewis & Elias (1981) is the inclusion of tribe Parkieae within Mimoseae. The former was circumscribed based on imbricate aestivation of the calyx, and was considered the basal tribe within the Mimosoideae (Elias, 1981a). Recent phylogenetic analyses (Chappill & Maslin, 1995; Luckow et al., 2000; Bruneau et al., 2001; Luckow et al., 2003; Herendeen et al., 2003a), indicate that the two genera in the Parkieae, Parkia and Pentaclethra, are not sister taxa (Fig. 24). Pentaclethra is nested within Mimoseae in Luckow et al. (2000), but is either sister to caesalpinioid taxa in Bruneau et al. (2001) and Herendeen et al. (2003a), or part of a basal polytomy with Mimoseae and caesalpinioid taxa (Luckow et al., 2003). Both Parkia and Pentaclethra are included in the tribe Mimoseae pending additional data and tribal recircumscription. Recent work (Luckow et al., submitted a) also indicates that the monospecific tribe Mimozygantheae should be subsumed in the Mimoseae near Piptadeniopsis and Prosopidastrum, currently in the Prosopis group. Otherwise, the informal groups within the Mimoseae recognised by Lewis & Elias (1981) are relatively well-supported by current phylogenies and only a few departures have been made from their system. Where relationships are either poorly supported or unresolved, the classification of Lewis & Elias (1981) is retained. The Xylia group is dismantled and the Adenanthera group recircumscribed to include Calpocalyx and Xylia . Desmanthus has been removed from the Dichrostachys group, as has Neptunia, in agreement with recent molecular and morphological phylogenetic studies (Harris et al., 1994; Hughes, 1998; Luckow, 1995, 1997). A new group is erected to accommodate Piptadeniastrum which is well separated from Newtonia in the most recent phylogeny (Luckow et al., 2000; 2003), and another to accommodate Cylicodiscus, which is more closely related to the clade containing the Prosopis, Leucaena, Dichrostachys, and Piptadenia groups than it is to the Newtonia group. Neptunia is well supported as sister to Prosopidastrum in recent analyses (Luckow et al., 2003) and is included in the Prosopis group here. Relationships of genera in the Prosopis group are not resolved, but the group is retained here as there is no evidence that it is not monophyletic. 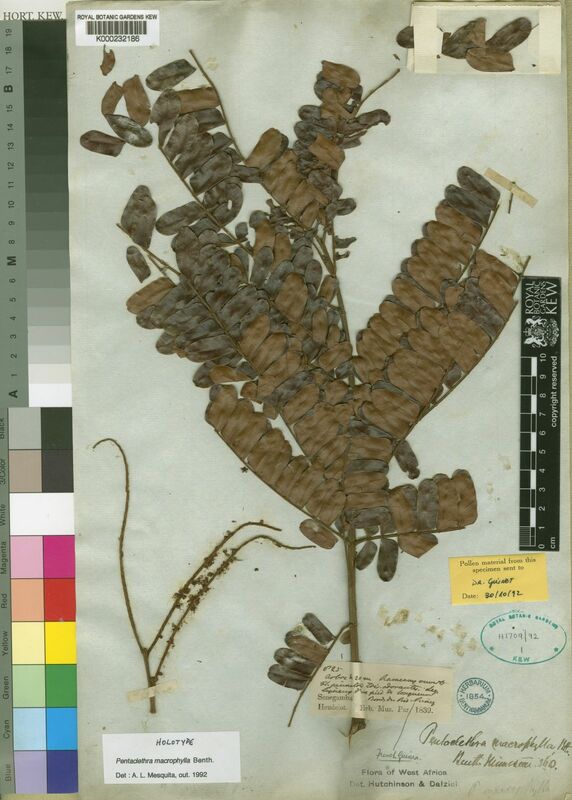 Genera newly described since 1981 include Alantsilodendron, Calliandropsis, Kanaloa, and Lemurodendron. Alantsilodendron and Calliandropsis are placed in the Dichrostachys group, and Kanaloa in the Leucaena group based on phylogenetic analyses (Hughes, 1998; Luckow, 1997; Luckow et al., 2000). Lemurodendron is tentatively included in the Newtonia group as suggested by Villiers & Guinet (1989). As treated here the Mimoseae comprises 40 genera and from (859)– 869–(879) species. Benth. in Trans. Linn. Soc. 30: 360 (1875).